Home » Neuroscience » You Do Have a Sixth Sense – and More! Ever wish you had more than just five senses? Sure, it’s cool to see, hear, touch, smell, and taste the world, but wouldn’t it be great to be able to sense other things? Perhaps you would prefer X-ray vision, telepathy, the ability to tell the future, or maybe you want to see dead people (or predict the twist ending of a movie…). Well NeuReaders, I’m NeuWriting to inform you that you all actually do have a sixth sense. And a seventh. Maybe an eighth. So do I, and so do most other humans on the planet. We use the Five Senses to perceive the world around us. Each of these senses specializes in a different type of information in the physical world. Vision detects light of particular wavelengths, hearing detects changes in air pressure, touch detects objects contacting our skin, and taste and smell both detect particular molecular shapes, the main difference being whether or not they are airborne. However, there are other aspects of our environment and ourselves that we sense — like gravity — and there’s nothing supernatural about them. First of all, what is a sense? Quantifying our senses will depend on having a specific definition. Are senses defined by the organs and cell types that do the sensing, the part of the physical world being sensed, or the information that we ultimately perceive? Of the handful of types of light-sensitive cells (photoreceptors) in your retina, some respond to specific colors of light. Should those be considered different senses? Most people would say no. On the other hand, some senses use similar cell types to detect completely different information. 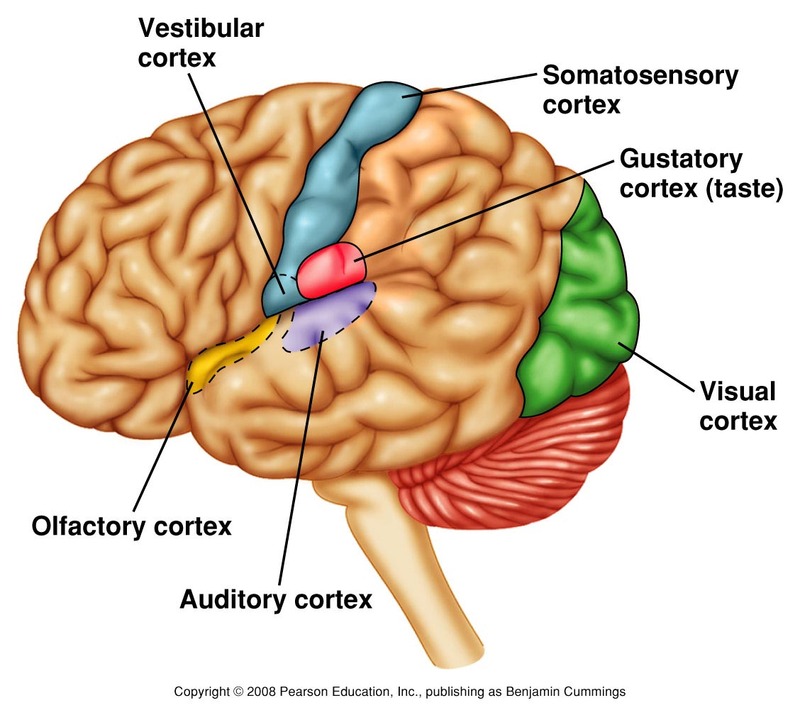 Typically left out from the big five, your vestibular system senses gravity, or more generally, acceleration of your head. Vestibular sensory cells are located in a series of tiny tubes in your inner ear, and detect the motion of membranes embedded with particles called otoliths (ear stones) within these tiny canals. When standing up straight, the otolithic membrane is pulled down by gravity, leading to your perception of the Earth’s pull. Other tiny tubes in different orientations sense gravity when you are laying down, and the semicircular canals work by a similar mechanism to sense head rotation. Remember when I said this all happens in the inner ear? The auditory system uses very similar cells to detect sound, except in that case they are within an amazingly specialized organ called the cochlea. When sound from the world strikes your eardrum, the smallest bones in your body amplify those vibrations en route to the cochlea, causing vibration of the cochlear membrane, which is then detected by these versatile sensory cells. You can see how the answer to the question “what is a sense” becomes quite complicated. In practice, the subjective boundaries between senses are largely determined by combining our perception of what feels like different senses and the appearance of obvious sensory organs (eyes, ears, nose, tongue, skin). However, I can prove to you that we should not categorize a sense based on the part of the physical world it detects. Let’s do an experiment. Did you see something? It should be all the way to the left of your visual field. You should see a light spot moving around. But your eyes were closed. How could this be? To begin explaining why this occurs, first I’ll ask you a question. Consider it a thought experiment. What aspects of the physical world do your eyes detect? If you said “light” or “photons,” you’re not wrong. And that’s exactly what your brain is expecting your eyes to detect. The short explanation is that biology is imperfect. Some of our sensory cells are not perfectly specialized; they respond to additional physical properties of the world. Photoreceptors in your eye also happen to be activated by mechanical pressure. So when you lightly poke your eye, you are activating cells that usually detect light. In turn, the visual cortex of your brain then misinterprets this activation as visual information, making you see spots of light. Misinterpretations such as this are responsible for a great deal of perceptual illusions, and can give us clues about how our brains process sensory information. But why does the brain make this mistake? It starts with a fundamental property of the nervous system: the language of neurons. Neurons communicate through action potentials, or spikes, which only occur when there is enough input from other neurons at roughly the same time. As far as we know, spikes are just spikes — there is nothing about a spike that says “I’m visual” or “I’m a smell.” Thus in order to make sense of these spikes, the brain must rely on other types of information. One is the relative timing of the spikes (e.g. fast or slow, constant or bursting), though what these variations actually signal is still poorly understood. Another type of information is contained within the physical connections of the brain: where the signal is coming from. Your brain is relying on this second type of information when it misinterprets the eye-poke as a spot of light. Spikes that end up in the visual cortex are almost always due to light activating photoreceptors, so your brain just assumes that is always the case, and thus accepts the occasional sensory illusion. You may have wondered why poking the right corner of your right eye created the perception of a spot of light to your left. When light comes from your left side, and travels through your pupil, it hits the right side of your retina. 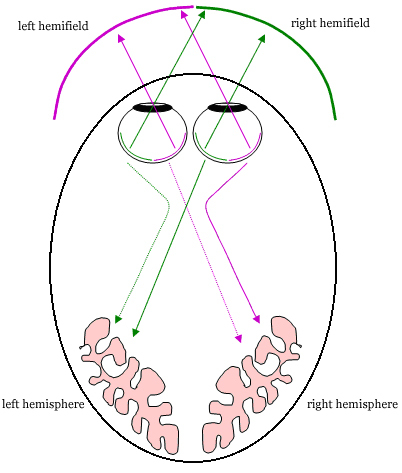 This sets up a map of visual space, called retinotopy, that is preserved throughout many visual areas in the brain. Other senses also have these maps, although they are less obvious than vision. For example, sounds are mapped according to frequency in some auditory areas, but according to location in others. The maps in brain areas responsible for smell, or olfaction, are still unclear — if they are even mapped at all. But what happens if you lose one of your senses? It turns out that your brain has an amazing ability to reorganize. Several people who have been blind from an early age, or from birth, have taught themselves to use echolocation to navigate. The story of one of them, Daniel Kish, famous for echolocating while riding a bicycle, is excellently told in an episode of npr’s Invisibilia. Human echolocators make a clicking sound, and can perceive objects around them based on how the sound reflects back to them, similar to how a bat echolocates. And the incredible thing is, those echolocators who had not been blind their whole life describe actually seeing images of objects around them when they echolocate, similar to how they remember the experience of vision, just more blurry and in black and white. Somehow, the brains of these individuals have transformed auditory information into visual perception. Recently scientists scanned the brains of echolocating individuals while they played back echolocation sounds corresponding to different types of objects, including moving ones. Not only were visual areas activated, but echos from moving objects actually activated the correct part of the visual map of the brain! (1,2) It turns out that echolocation experts can see nearly as well as our peripheral vision (3). This demonstrates one of the most amazing properties of the brain — its consistently underestimated ability to dramatically change, referred to as plasticity. While connectivity patterns are important for the brain to interpret sensory signals, over time it can learn to change these interpretations. These types of discoveries further blur the lines between the senses, and reiterate the question: what is a sense? Is it defined on the perceptual end? Or at the beginning of the process, when some aspect of the physical world interacts with our tiny sensors? Is human echolocation some form of vision, or is it strictly an auditory navigation strategy? These are all fascinating questions and the subject of current research. We don’t know….yet. Hopefully, studying these questions about how the brain interprets sensory information will yield discoveries that help people with sensory deficits get back to having closer to their normal six, seven, or eight senses. Would you like to know more about how your nervous system measures the physical properties of the world and transforms that into useful information that you can use to navigate the environment? Do you just want to figure out the definition of a sense? Look forward to my forthcoming series of posts that explore the amazing properties of our six (or seven or eight) senses!